Quick update on the markets | Can Turtles Fly? Futures market for movies -- yay or nay? Share book reviews and ratings with Sivaram, and even join a book club on Goodreads. An investment blog chronicling a slow-moving turtle's attempt at gaining financial independence. Mostly contrarian investing with value-investing tilt and influenced by macroeconomics. Feel free to visit my non-investment blog describing my life and thoughts. 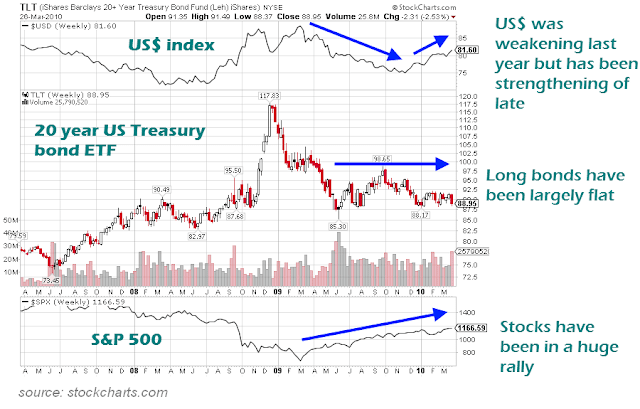 The following is a graph, courtesy stockcharts.com, of three key indicators I like to look at: stocks, US treasuries, and the US$. There aren't many surprises in the chart. As many would realize by now, the stock market has been in a major rally (haven't checked but probably the 2nd or 3rd biggest rally in the last 100 years); bonds have gone nowhere (a lot of stories of gloom and doom about USA possibly running into difficulties with debt financing but prices are basically what they were almost an year ago); but the US$ index chart is a surprise to me. Usually a stronger currency is good for government bonds (or indeed any asset denominated in that currency) but that hasn't been the case with US Treasuries lately. US Treasuries have largely been flat (to slightly negative) while the US$ has been strengthening. 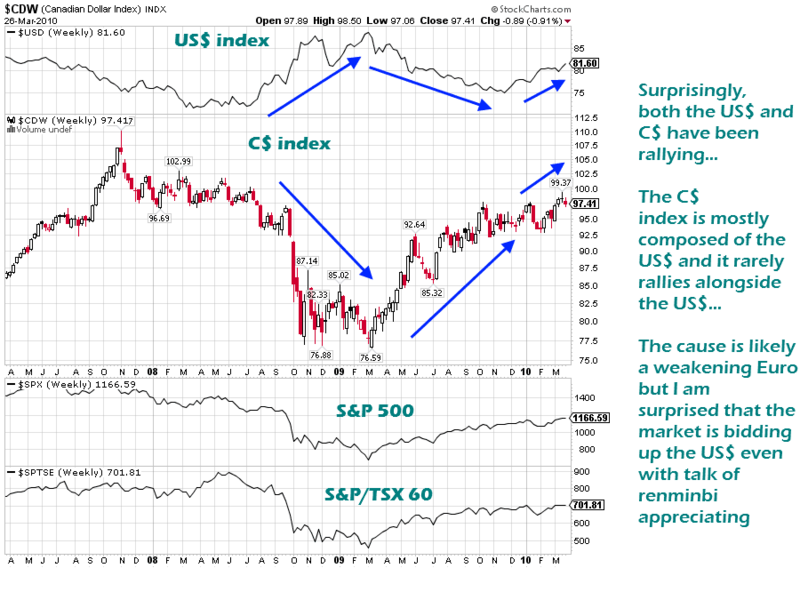 Maybe it's just a temporary blip but I can't remember the last time the C$ index appreciated along with the US$ index. The main factor driving all this is the weakening Euro. It remains to be seen what happens when the Greek problems are sorted out. Will we see the US$ start to weaken or will it continue to strengthen? Another interesting thing is that market participants have been bidding up the US$, even though some claim that China is about to re-value its currency upwards. Instead of going into another currency or hoarding gold, investors still seem to be confident enough with the US$. 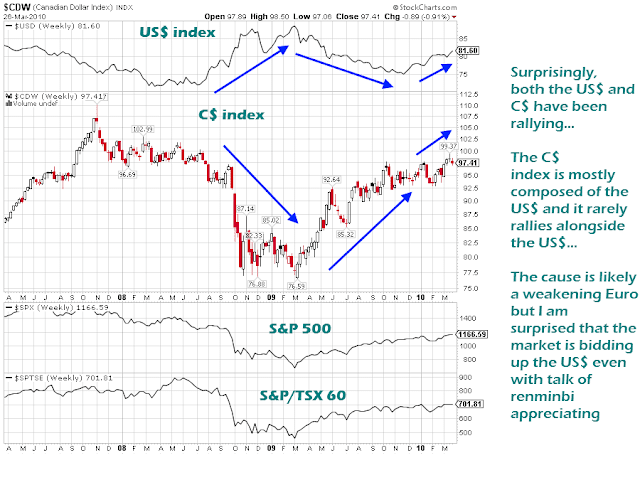 A strengthening US$ is usually bad news for the commodity complex but so far nothing significant has occurred. The CRB index (not shown) and WTIC crude oil (not shown) have been flat for several months now. It's way too early to say but I wonder if commodities are topping out. One of the big question marks for commodity bears like me is whether crude oil set a multi-decade peak in 2008. If crude oil doesn't break US$147 within a few years, it has likely entered a bear market. Crude oil should be strong in the next few months, as the summer driving demand keeps it up, but if it tops then it may indicate that commodities may have set a multi-decade peak in 2008. Up until a few months ago, the pattern for the last few years has been that whenever markets go up, the US$ goes down, and whenever markets go down, the US$ goes up. It is interesting to see this pattern broken, with markets and the US$ both rallying at the same time. It seems like the market is getting past the cycle of fear (bid down the markets, and up the safe-haven US$) alternating with relief (reverse those trades). Personally I think the market is a bit premature in assuming that the economy is bound for a fast recovery (at least in the US). I think there's plenty of evidence on both sides, and some unprecedented events and actions, so I'm making no assumptions here. The key is what happens when the FedRes withdraws stimulus, particularly the mortage market. Copyright 2013 Can Turtles Fly? All Rights Reserved. Sivaram Velauthapillai.